The skid control ecu forms a single unit with the abs and traction actuator. Abs (anti-lock brake system): the abs helps prevent the wheels from locking when the brakes are applied firmly or on a slippery surface. 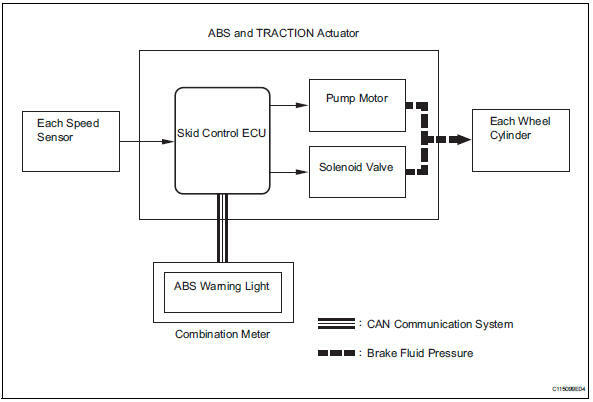 Operation description: the skid control ecu detects wheel lock conditions by receiving vehicle speed signals from each speed sensor, and sends control signals to the pump motor and solenoid valve to prevent wheels from locking by controlling the brake fluid pressure of each wheel cylinder. The abs warning light comes on when the abs system malfunctions. Ebd (electronic brake force distribution): the ebd control utilizes the abs to create the proper brake force distribution between the front and rear wheels in accordance with the driving conditions and vehicle load. In addition, when the brakes are applied while cornering, it also controls the braking forces of the right and left wheels, helping to maintain vehicle stability. 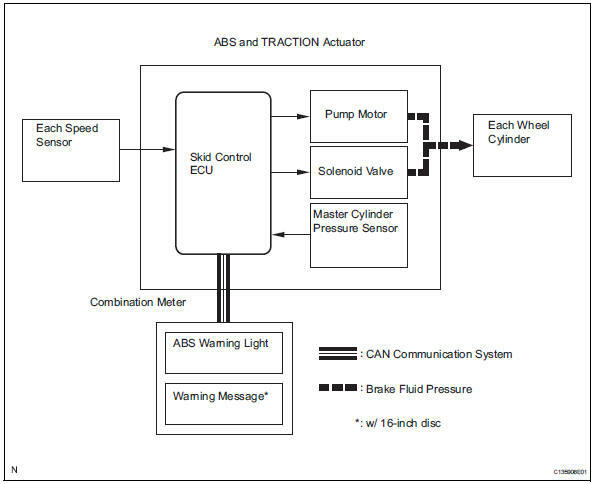 Operation description: the skid control ecu receives speed signals from each speed sensor to detect the slip conditions of the wheels and sends control signals to the solenoid. The solenoid valve controls the brake fluid pressure of each wheel cylinder and divides the control power properly between the front and rear wheels and the right and left wheels. The brake warning light comes on to indicate malfunctions in the ebd system. Ba (brake assist): the primary purpose of the brake assist system is to provide auxiliary brake force to assist drivers who cannot generate a large enough brake force during emergency braking, thus helping to maximize the vehicle's braking performance. 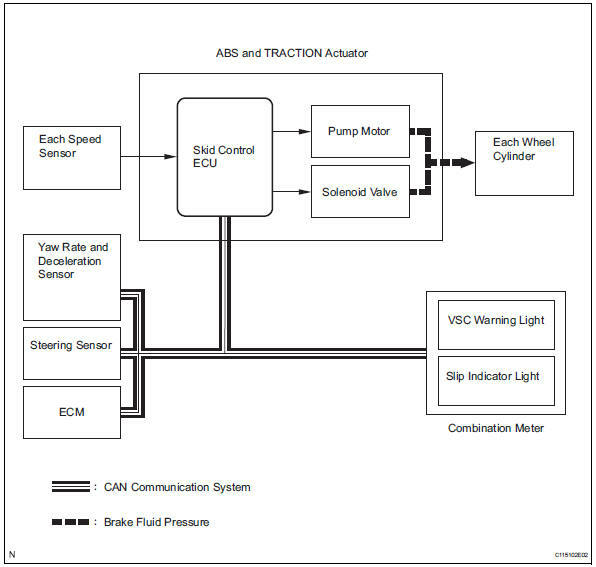 Operation description: the skid control ecu receives speed signals from each speed sensor and the fluid pressure signal from the master cylinder pressure sensor to determine whether brake assist is necessary. If brake assist is deemed necessary, the skid control ecu sends control signals to the pump motor and solenoid. The pump and the solenoid valve then control the pressure applied to each wheel cylinder. The abs warning light comes on to indicate malfunctions in the ba (brake assist) system. W/ 16-inch disc: the brake warning light and abs warning light come on to indicate malfunctions in the ba system. Trc (traction control): the trc system helps prevent the drive wheels from slipping if the driver presses down on the accelerator pedal excessively when starting off or accelerating on a slippery surface. 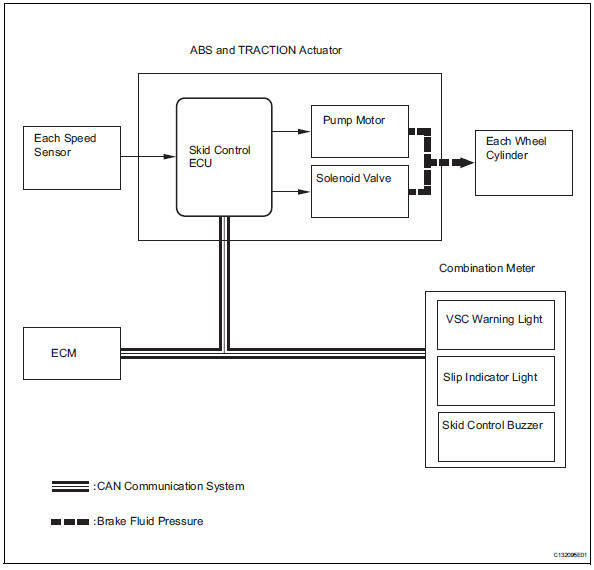 Operation description: the skid control ecu detects the vehicle's slip condition by receiving signals from each speed sensor and the ecm via can communication. The skid control ecu controls engine torque with the ecm via can communication and brake fluid pressure through the pump and solenoid valve. The slip indicator light blinks when the system is operating. For 4wd: the vsc warning light comes on when the trc system malfunctions. For 2wd: the vsc warning light and slip indicator light comes on when the trc system malfunctions. Vsc (vehicle stability control): the vsc system helps prevent the vehicle from slipping sideways when front or rear wheel skidding occurs while cornering. 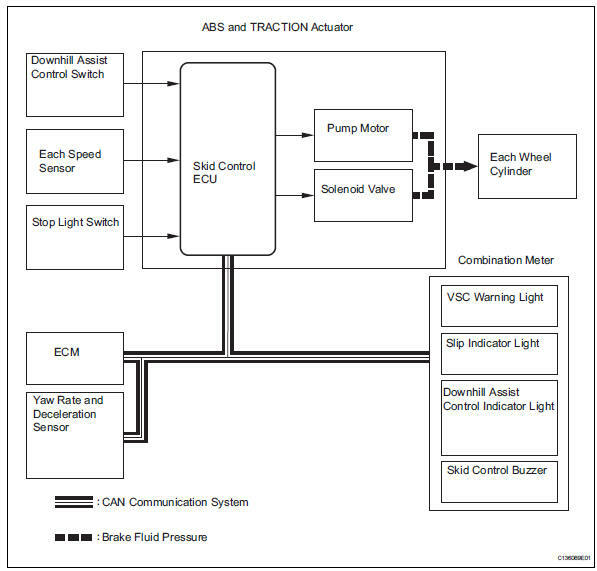 Operation description: the skid control ecu determines the vehicle condition by receiving signals from the speed sensor, the yaw rate and deceleration sensor and the steering sensor. The skid control ecu controls engine torque with the ecm via can communication and brake fluid pressure through the pump and solenoid valve. The slip indicator light blinks and the skid control buzzer sounds when the system is operating. For 2wd: the vsc warning light and slip indicator light come on when the trc system malfunctions. Downhill assist control: when the downhill assist control switch is pressed with the shift lever on l or r range and the accelerator and brake pedals not depressed, downhill assist control is activated. When activated, 4-wheel hydraulic pressure control occurs in order to maintain a constant low vehicle speed without causing the wheels to become locked. Thus, the vehicle can descend a steep hill in a stable manner. Depressing the accelerator and brake pedal cancels control of the downhill assist control. Downhill assist control begins operating when driving down on a slope at a speed of 25 km/h (16 mph) or less with the engine brake applied. Operation description: the slip indicator light blinks and the downhill assist control indicator light and brake light come on when the system is in operation. The vsc warning light comes on and the downhill assist control indicator light blinks to indicate a malfunction in the downhill assist control. Hill-start assist control: when the vehicle starts off on a steep hill, hill-start assist control effects 4-wheel hydraulic pressure control to prevent the vehicle from rolling backwards. After a maximum of 2 seconds after the control has started, fluid pressure is gradually released and control will be complete. Depressing the brake pedal cancels control of the hill-start assist control. Hill-start assist control does not operate when the shift lever is in the p position, or when the vehicle is running, the parking brake lever is set, or the accelerator pedal is depressed. Operation description: when the system is in operation, the following occurs: 1) the slip indicator light blinks; 2) the vsc light comes on; and 3) when hill-start assist control operation starts, the skid control buzzer sounds once; when hill-start assist control operation ends, the skid control buzzer sounds twice. The vsc warning light comes on when the hillstart assist control is malfunctioning. Auto lsd (auto limited slip differential) for 2wd: the auto lsd achieves the equivalent functions of an lsd (limited slip differential) through the use of a traction control system. When the driver presses the auto lsd switch, this system achieves the lsd effect by regulating the hydraulic pressure that acts on the drive wheels and controlling the engine output in accordance with the amount of pedal effort applied on the accelerator. The auto lsd operates with the auto lsd switch on and the accelerator pedal depressed. Wheels run off the road. Drive wheels spin in place when starting on a slope with one wheel on snow/ice. Releasing the accelerator pedal cancels control of the auto lsd system. 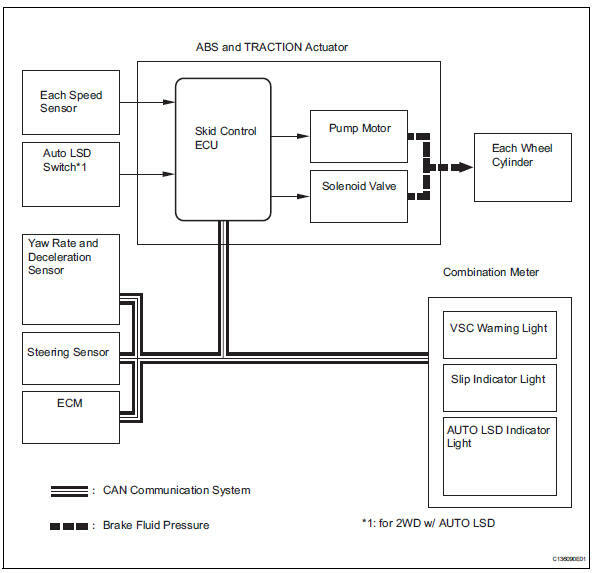 Operation description: the skid control ecu determines that the vehicle is in a state in which the auto lsd can operate by using various sensors and switches to detect the operating conditions of the auto lsd switch, shift position, accelerator pedal, and brake pedal. When the vehicle is in a state in which the auto lsd can operate, the skid control ecu effects hydraulic pressure control of the wheel cylinder at the wheel with the faster wheel speed so that the wheel speeds of the right and left drive wheels will become equal. The slip indicator light blinks and the auto lsd indicator light comes on when the system is operating. Both the vsc warning light and slip indicator light come on when the auto lsd system malfunctions. Braking when surface resistance differs between left and right wheels if the driver suddenly applies the brakes on a road surface with a considerable difference in friction coefficient between the right and left wheels, the difference in the brake force between the right and left wheels will cause the vehicle posture to become unstable and create a yaw movement. 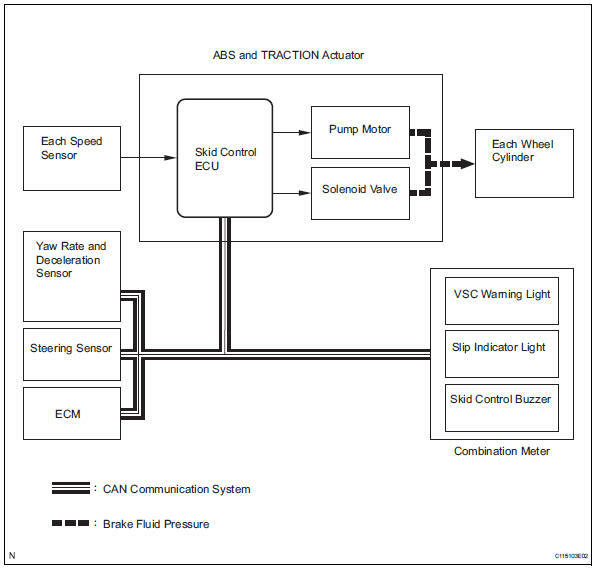 In this state, the skid control ecu controls the vsc to stabilize the vehicle posture. At the same time, it effects cooperative control with the eps to provide steering torque assist, which facilitates the driver's steering maneuvers to stabilize the vehicle posture. Accelerating when surface resistance differs between left and right wheels if the driver suddenly starts off or accelerates on a road surface with a considerable difference in friction coefficient between the right and left wheels, the slippage of a drive wheel will cause the vehicle posture to become unstable and negatively affect its acceleration performance. 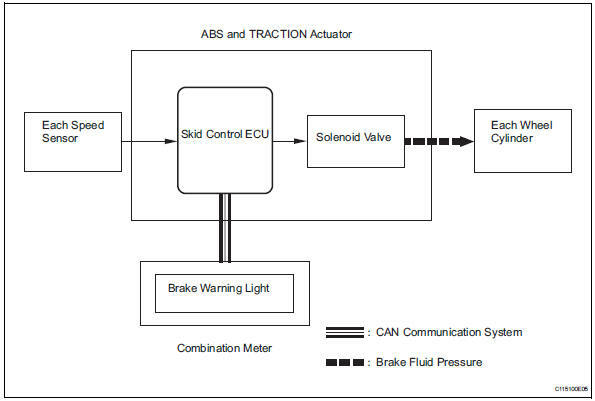 In this state, the skid control ecu causes the trc to control the hydraulic brake of the slipping drive wheel, and requests the engine ecu to effect engine output control. At the same time, it effects cooperative control with the eps to provide steering torque assist, which facilitates the driver's steering maneuvers to stabilize the vehicle posture. Front wheel skid tendency when the skid control ecu determines that there is a front wheel skid tendency, it controls the vsc to dampen the front wheel skid. At the same time, it effects cooperative control with the eps to provide steering torque assist, which facilitates the driver's steering maneuvers to stabilize the vehicle posture. To prevent excessive steering maneuvers, it provides a steering torque assist. This assist increases the resistance to counter the driver's steering effort, if the driver turns the steering wheel excessively. Rear wheel skid tendency when the skid control ecu determines that there is a rear wheel skid tendency, it controls the vsc to dampen the rear wheel skid. At the same time, it effects cooperative control with the eps to provide steering torque assist, which facilitates the driver's steering maneuvers in the direction to correct the rear wheel skid. Acceleration during cornering a sudden acceleration of the vehicle during cornering may cause a drive wheel to freewheel, which could cause the front wheels or rear wheels to skid. If the skid control ecu determines that there is freewheeling of a drive wheel, a front wheel skid tendency, or a rear wheel skid tendency, it effects cooperative control with the 4wd system to optimally control the drive torque distribution to the front and rear wheels. Furthermore, it controls the trc and the vsc as needed to ensure driving stability and acceleration performance. The operation of the solenoid valves under the cooperative control is the same as the trc or vsc operation. The skid control ecu calculates vehicle stability tendency based on the signals from the 4 wheel speed sensors, the yaw rate and deceleration sensor and the steering sensor. In addition, it evaluates the results of the calculations to determine whether any control actions (control of the engine output torque by electronic throttle control and of the brake fluid pressure by the abs and traction actuator) should be implemented. The slip indicator blinks and the skid control buzzer sounds to inform the driver that the vsc system is operating. The slip indicator also blinks when traction control is operating, and the operation being performed is displayed. 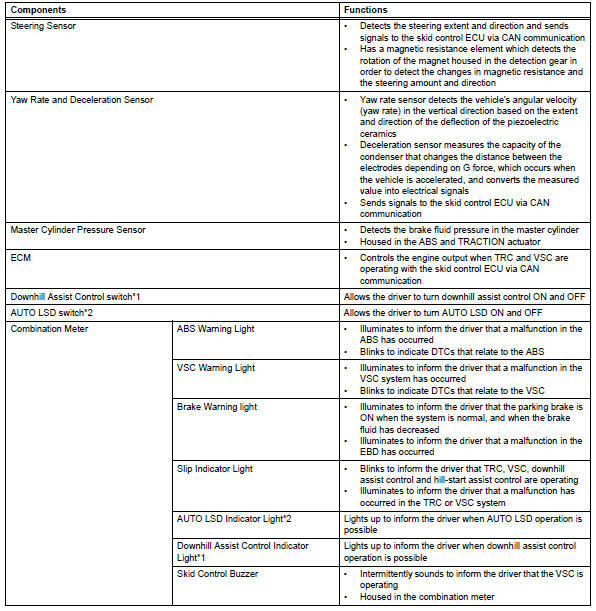 When a failure occurs in the abs with ba, trc and vsc systems, the abs and vsc warning lights illuminate, the slip indicator light comes on*1 or remains off*2, and the operations of those systems are prohibited. In addition to this, when a failure which disables the ebd operation occurs, the brake warning light comes on and its operation is prohibited. If control is prohibited due to a malfunction during operation, control is disabled gradually to avoid sudden vehicle instability. When the vehicle speed first reaches approximately 6 km/h (4 mph) or more after the ignition switch is turned on, each solenoid valve and the motor of the abs and traction actuator are sequentially activated to perform electrical checks. During the initial check, the operating sound of the solenoid valve and motor can be heard from the engine compartment, but this does not indicate a malfunction. Vsc operation can be disabled by operating the intelligent tester.